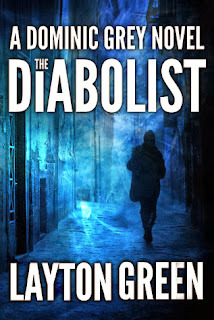 Join Layton Green, author of the suspense/mystery/thriller novel, The Diabolist, as he tours the blogosphere October 1 – October 31, 2013 on his first virtual book tour with Pump Up Your Book! Oh man, what a book--it takes you through a (fictional) study of the world's most dangerous religious cults and the differences between them. It is the story of two men who used to be friends-one turned to a life of study; the other to the life of a cult leader wanna be who almost makes it! Grey who works with his partner Viktor as private investigators of cults transverses continents in pursuit of the elusive cult leader who is slowly killing off other cult leaders. Who will win this battle of good vs evil? I'll let you read the book and decide! The crimson walls and vaulted ceiling hovered over the aisles with garish menace, pentagrams served as stained glass windows, an inverted crucifix hung on the wall behind the pulpit. Guttered candles lit the interior with a red glow, and Matthias had to admit the architects had achieved the desired effect: He felt as if he were walking straight into the mouth of Hell. Recognized by the government as an official nonprofit religious organization since 1966, Matthias had shepherded the House of Lucifer into hundreds of chapters worldwide. In the sixties and seventies, America had been fascinated by the House and other occult pseudo religions that had sprung up, like demented cornstalks, out of a collective repressed subconscious. Now demons and warlocks and vampires were regular occurrences in popular novels and films, and the popularity of the occult had leeched its power to shock. Which made it all the easier, in Matthias’s mind, to carry out the business of the House. he had closed up the night before, and there had been no letter. Matthias glanced at the clock above the front entrance, his eyes resting on the two naked succubi forming the hands. Twenty minutes until midnight. Incense wafting into the cathedral added to the gloom, swirling in scarlet motes above the aisles. Matthias waved a hand, his lieutenant struck a kettle gong, and the congregation began intoning the words to one of the Satanic psalms. pulpit, inside an envelope sealed with red wax, a single word handwritten in capital letters on the face of the envelope. Matthias had opened the envelope with a frown and read the words, scrawled in black ink, that appeared below his own name. You will renounce your false religion and declare yourself a HERETIC, or you will die at the hand of the one true God on the sixth midnight hence. The next night Matthias told his congregation about the letter, and in a show of righteous fury he announced a special worship service on the night of his threatened demise. Tonight was that night. Just in case, he had tightened security for the service. A quarter to midnight. It was time to begin. Matthias held the letter up, shaking it in his fist. “One more childish letter from the narrow-minded,” he shouted, as the members smirked and clapped. “One more act of hate from those who preach love.” The high priest made a good living from the generous tithing of the congregation, but this job was not just about the money. Nor was it about the Devil. Matthias did not actually believe in Lucifer or any other supernatural being; he did not believe in anything outside the Darwinist reality of his own existence. What he did believe in was satisfying his natural carnal desires, and he despised any person, government, religion, or institution that stood in his way. His members hailed from all walks of life. Plenty came from the margins of society, but there were also businessmen, professionals, politicians, and even a few elebrities. Some joined for the novelty, some joined for the secret orgies, but most joined because they believed in the mission of the House, which was the ridicule and disruption of mainstream religion. His eyes slid to the clock. Eleven fifty. Matthias continued his speech, analogizing the death threat to prophecies from other religions that had failed to come true, especially some of the pseudo-Christian cults whose response to failed prophecy was to change the words of the sacred texts and issue new versions. The vigorous nods of the congregation energized him. As the gong announced the stroke of midnight, Matthias ripped the letter in half with a triumphant shout. Instead of the cheers he expected, the members in the front row reared in alarm. Some flung outstretched fingers in the direction of the pulpit. Even Oak, Matthias’s right-hand man and virtual cofounder of the House, looked stunned, and Oak wasn’t stunned by much of anything. The lump in Matthias’s stomach expanded, tightening his chest with the grip of fear. disappeared, winking out of existence as impossibly as it had arrived. With his last coherent thought, Matthias wondered if he had been wrong all this time, and if Lucifer himself had not come to reclaim his house. Entered!!! 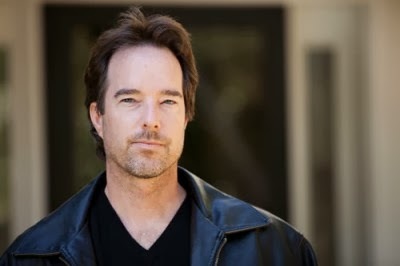 - What a hunk of an Author he is!!! Honestly I just read some parts of the blog and then I saw the author which is close to unbelievable. You know authors used to be look like old man historian (he he). Anyways will come back to read more about the book. Another great recommendation. I am in on this giveaway too! Sounds like a great read...especially with Halloween just around the corner! This sounds like a great book! Love the review. Definitely my kind of book. Hope I win, but if not, it will definitely still make my reading list. I love thrillers!! This one looks "edge of your seat"!!! Entered. Sounds like a book I would have trouble putting down. Sounds like a page turner! I've added it to my tbr list. this is very interesting, I joined and follow. hope to get this awesome book. The plot of the story seems interesting. awesome book and great giveaway. I could use $100 for amazon right now. Gripping right from the get go! 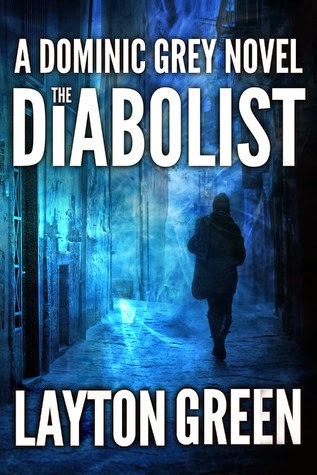 This book sounds very Dan Brown and I would love to read it. I am going to make a note on the giveaway to see if I can remember to come back and enter. That is a great prize! I love finding new books to read from following you. A good book and a great giveaway, thank you.